Local business owners have more incentive than ever to make sure their Google listings are correct. 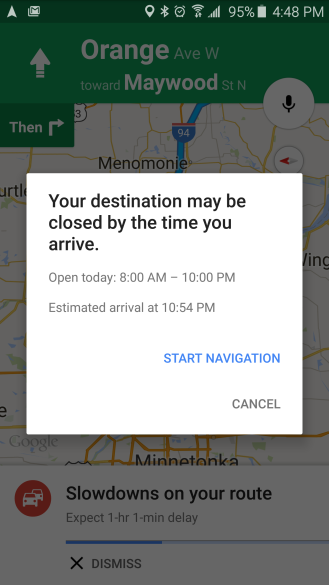 As first reported by Android Police, Google Maps has recently added a feature that tells users to turn around and go home if they are using Google Maps to navigate to a specific place if that location will be closed by the time they are expected to arrive. If you keep up with making sure your local listings are always up-to-date and accurate, this shouldn’t be much of a worry to you, however if your business has incorrect hours listed the new feature could wreak havoc on your store traffic. With the new feature, having the wrong time listed is almost like forgetting to turn the sign from closed to open at the start of the day. How Can Smaller Businesses Compete With The Big Names Online?